The Snackmaster Pro FD-75A from Nesco is a modern machine that will improve your experience when it comes to food dehydration. This device is a class higher than the others, and it uses a Converga-Flow System to ensure fast and even drying. It also has an adjustable thermostat that lets you vary the temperature between 95 and 160 degrees and a Vita-Save exterior that will block any harmful light that may destroy food nutrients during dehydration. The five tray machine is also expandable to 12 to ensure that you get a large drying space for your food. Adjustable Thermostat: The adjustable thermostat is one of the best features on this machine as it enables you to dry different foods at the right temperature. Converga-Flow System: This system is one of the things that make the FD-75A popular as it helps food to dry faster and also eliminates the need to keep rotating trays. Vita-Save Exterior: Vita-Save blocks out any harmful lights that may destroy nutrients when the food is dehydrating. Power: It has a top mounted fan and will give you an impressive 600 watts of drying power which is more than enough for most types of foods. Trays: FD-75A comes with five shelves, but they are expandable to a maximum of 12 to give you a huge drying area. Extras: When you buy this dehydrator you will also get two mesh sheets, two solid sheets, a recipe book to get you started and some jerky spice packets. Dimensions: It is quite a compact machine as it only measures 13 x 13 x 10 inches. 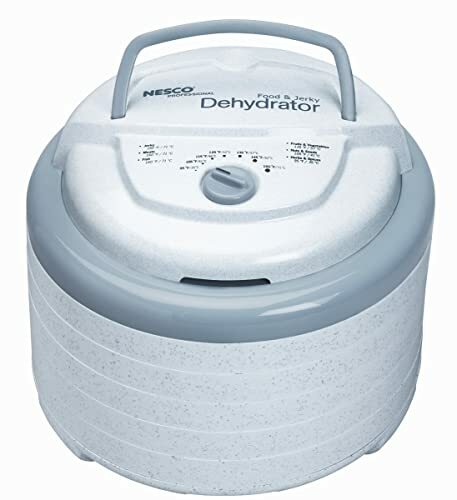 Snackmaster Pro FD-75A from Nesco is a best food dehydrator that uses the latest technology to ensure that you can dehydrate all your foods efficiently and within a very short time. This device has many advantages such as the adjustable thermostat that will let you adjust the temperature according to the food and also the expandable trays that will give you a huge drying space. You can also use this machine for many other purposes such as making yogurt, and this makes it a very useful device to have at home. However, when shopping for anything you should also consider the negatives or disadvantages and for this machine, this can include the lack of a timer and the fact that it uses a lot of electricity. But, if you consider every advantage and negative thing on this dehydrator you will see that it is worth buying.